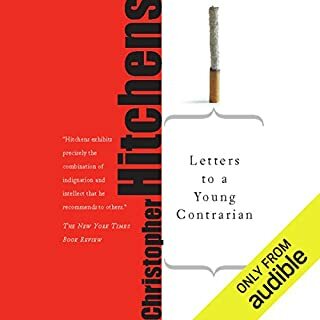 This is the 3rd Hitchens audiobook for me and it's my favorite. The "letters to" format works particularly well in keeping the topics flowing. The writing is his best. The range of topics makes this a good primer book. Agreement with the author is not necessary to appreciate it - although I agreed with more than I expected. There's just something about impeccable writing with just the right words chosen for clarity on intellectually stimulating topics. A few passages I returned to a few times because they really made me think. One passage I returned to repeatedly around the 1 hour mark regards an "AS IF" strategy of surviving troubling "Real Politik" with historical examples - wow - good stuff. Hitchens as narrator I would have preferred. This guy is a close second though - his tone and timing is right on for the author's work.